Over the last couple of years, with a baby and book-in-progress, I found I largely lost the ability to read whole books. Sure, I pillaged for research, I browsed magazines, and I frantically devoured books and blog posts about how to get your baby to sleep/eat/stop crying, but I didn’t just read for pleasure. So now that the latest book is completed and toured, I decided I wanted to just read for fun for a bit. Whatever I happened to find on my shelf (or someone else’s), or at a used book sale or library. So for the last ten days of the year, I will do short reviews of this eclectic mix of titles that have helped me remember the simple joy of reading. #1. I found this sitting on the shelf of a vacation property on Gabriola Island a couple of weeks ago. One morning I woke up at 4:30am and couldn’t get back to sleep, so I read it snuggled on the couch cover-to-cover before anyone else woke up! 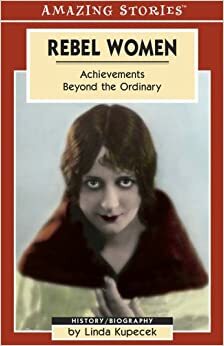 Rebel Women: Achievements Beyond the Ordinary (Heritage House) By Linda Kupacek A title in the Amazing Stories series of books, this collection of portraits of ‘rebel women’ fits right in with its clear prose, funny anecdotes, and, yes, amazing stories lifted from the lives of some pretty incredible ladies. I particularly appreciated the mentions of silent film actress and writer/director Nell Shipman, as well as Katherine Stinson, who was responsible for the first air mail delivery here in Edmonton. Isobel Gunn was also a fascinating figure and kudos to the author, Linda Kupacek, for the historical digging that went into uncovering her story (as well as the stories of the other women). This is a great way to inspire new generations of women growing up in Canada’s West – and around the world – and an enjoyable way to learn some history while you’re at it!